By the time I was seven years old, I knew I wanted to be a veterinarian. When an animal was hurt in my neighborhood, everyone knew that I would be the first one there to try to help. When I turned 13, I started volunteering at a veterinary practice in my town. Throughout high school I never lost sight of my dream. 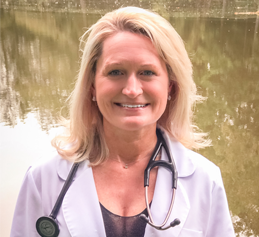 After graduating from high school, I earned my Bachelor’s degree at North Carolina State University (NCSU) and completed my doctorate at the College of Veterinary Medicine at NCSU. After practicing in Wilmington, NC for a few years I moved back to Winston Salem, as I’ve always considered that my “true home”. I began working as an Associate Veterinarian, in the same practice where I volunteered as a teenager, and was soon promoted to the Medical Director position. I am also married and the happy mother of two amazing children, one dog, one cat, two ducks, one rooster, and five hermit crabs. We are constantly growing our animal family as it brings us so much joy. I look forward to taking care of your animal family as much as I enjoy taking care of my own. Kimberly grew up loving animals but it took several years to realize her true passion was working with animals. She graduated from Surry Community College with certification as a Nurse's Assistant I and Medication Technition following shortly after. Kim feels lucky to find something she is passionate about and is privileged to be able to do it almost every day. 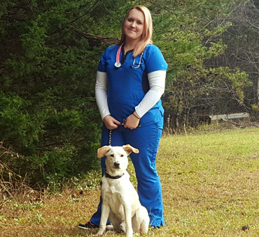 She has been involved in veterinary medicine since September 2017 and is currently enrolled in Penn Foster's Veterinary Technition program. Her other hobbies and passions include spending time with her furbabies and fiance, anything outdoors, photography, and working on her new fixer upper house.